In today’s episode we continue our series of blogger stories where I hand the podcast over to you listeners to tell your stories and tips about starting and growing your blogs. We kicked off the series three episodes back with a DIY blogger, and yesterday we featured two tech/Microsoft bloggers. Today I’m introducing you to Erin Chase, a friend of mine. In 2008 she started a blog where she documented what she was having for dinner each night, hoping it would help people on a budget cook affordable meals for their family. Erin’s simple idea has grown into a blog with MILLIONS of readers, and has become an extremely profitable business for her. We’re sharing these blogger’s stories in the hope of inspiring people to start some great new blogs in the year ahead. In the second week of January we’re launching a free course on ProBlogger to help as many new bloggers as possible get started by equipping them with great foundations. Should You Blog Anonymously or Use Your Real Name? Darren: My name is Darren Rowse and I’m the blogger behind problogger.com. A blog, a podcast, event, job board, series of ebooks, and soon to be courses all designed to help you as a blogger to grow your blog. The archives of your blog, the traffic of your blog, the community of your blog and the income around your blog as well. You can learn more about ProBlogger and all that we do at problogger.com. In today’s episode, we’re continuing our series of blogger stories where I’m handing the podcast over to you as the listener of this podcast, to tell your story, and to share some tips of starting and growing your blogs as the community of ProBlogger. We kicked off this little series three episodes ago now with a DIY blogger. Yesterday, we featured two tech Microsoft bloggers. Today, to do something a little bit different, I wanna introduce you to a friend of mine, who, back in 2008, started a blog that would document what she was having for dinner every night in the hope that it will help others on a budget to cook affordable, healthy meals for their families as well. It’s such a simple idea but one that this blogger has grown into a blog with millions of readers and six figure income. In fact, she hit that level in her second year of blogging. It’s become an extremely profitable business. We’re sharing these blogger stories in the hope of inspiring some great new blogs to be started in the year ahead. In the second week of January 2018, we’re launching a free course on ProBlogger with the goal of equipping as many new bloggers as possible to get started with great foundations for profitable blogs. If you wanna start a blog or a second blog, sign up to be notified of this free course. Now, we’re starting in a few weeks’ time now at problogger.com/startablog. You can find today’s show notes with a link to that Start a Blog course, and a full transcript of today’s story over at the show notes at problogger.com/podcast/223. 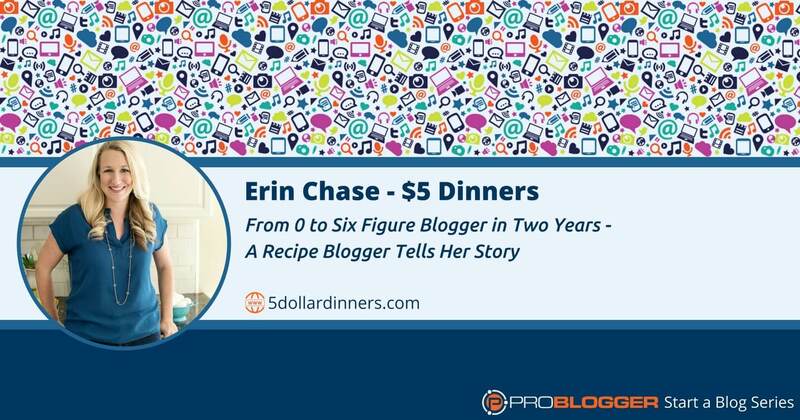 Today’s blogger story is from Erin Chase from 5dollardinners.com. I’ve been hearing stories about Erin and the business that she’s built for many years now. When this year I had the opportunity to meet her face-to-face, in person, for the first time and to start an event with her at the Success Incubator event that we ran earlier in the year, I leapt at that opportunity. Erin is a real go-getter who has built a remarkable business. If you talk to her today, or if you go and look at 5dollardinners.com today, you will see something quite special. You see something that doesn’t even look like a blog anymore. She’s got millions of readers, lots of amazing content, she’s been featured in lots of mainstream media and she’s making a good income from her business as well. In fact, she’s got numerous businesses today. What I love about it is that what she’s gonna share today is how it all started. It started so simply – as a blog where she shared the dinner she was making each day and the cost of that. She would not have known when that started where it was going to lead, it started so simply. Today, as I mentioned at the top of the show, it’s now over six figures business, she hit that level after a year or so of blogging, second year. It’s quite remarkable. It all started so simply and that’s what I want to share today. I’m gonna introduce Erin and let her take over the podcast. I’ll come back at the end just to make a few comments about some of the things that she said that I love and give you some further listening and reading as well. Erin: Hey there! My name is Erin Chase and I am the founder of 5dollardinners.com where I share budget-friendly recipes with those who are looking to save money on groceries and make it easier to get dinner on the table. We share all of those tips, and tricks, and recipes at 5dollardinners.com. I started the website back in the Summer of 2008 when the gas prices started to jump up here in the US. My husband had a long commute to work at the time, and we were seeing our gas for our car double. In order to not go into the red, I needed to cut back somewhere, so I decided to cut back on our grocery spending. I was not working at the time, took it upon myself to spend less of my husband’s hard-earned money, and I couldn’t keep my mouth shut about what I was learning, about grocery shopping, about the strategy behind grocery shopping, about how you can mix and match ingredients together to come up with these great budget-friendly meals with these ingredients that I’ve gotten on sale or even sometimes close to free or even free. I started showing about that on my family blog and my sister was like, “Yeah, no thanks. I just wanna see pictures of the kids.” I decided to start a second blog, we had our family blog going which I do not keep up with anymore. I started 5dollardinners as the place to share basically what I was making for dinner that night, and how much I was spending, what I was spending at the grocery store, just tips for cooking, cooking tutorials, cutting hacks, just slicing green bell peppers, just all kinds of different things that I was learning and thought would be helpful for others to learn about as well. It started it originally just as a place to share and it quickly became a business for us. I didn’t even know that it could be a business when I first started but it quickly became one. I’m thrilled that it has. I’ve been on this adventure for the past nine plus years. I’m getting to help people, help inspire people, new ideas for dinner, and help them get out of the dinner rut, help them make getting dinner on the table easier whether it’s meal plans or just start slow cooker recipes or instant pot recipes. It’s just been a pleasure and an honor to do that. Looking back to when I very first started the website and what I’m grateful that I started with, I’m grateful that I started with a consistent plan. When I very first started the blog, I would share what we have for dinner every single day, Monday thru Friday. Then on Sunday, I would share my meal plan for the coming week. It was a rough plan but I did it consistently. Whatever we would make for dinner, I would just snap a picture of it with whatever camera I had back then which wasn’t a great one, and then I would just post what we had. I would post, sometimes, pictures of our shopping receipt which this is really how much this meat cost. I would put the price of what we had. But, I think having that sort of “this is what we’re doing” recipe Monday, Tuesday, Wednesday, Thursday, Friday, and then sort of a round up meal plan on Sundays. I would sometimes sneak in other articles or I would sneak in some tips in with the recipes and things like that. I am so grateful that I started with that habit of consistency and just having a plan around the content of what we’re gonna be sharing. Because when you’re blogging, and you’re blogging for business, or potentially blogging for business, you have to have a consistent plan not only for the content you’re gonna share but then how you’re gonna share, and how you’re gonna get eyeballs onto that content, whether that’s just eyeballs on your Facebook page, in growing your page, or driving traffic through Pinterest. However you’re going to then get the word out about your content, you have to have a plan for that as well. Having a plan for your content and having a plan for essentially the market you’re content marketing and the marketing of your content. I think, in hindsight, that is what I’m super grateful that I had going from when I very first started out. Mistakes that we made in the beginning I think was not putting myself out there, personally. I’ve certainly involved our family over the years but I think putting ourselves more is always the “what do I wish I had done” answer. What do I wish I had done differently over the years, I think would be putting myself out there. Because people are wanting to connect with you and they’re wanting to connect with your story, and they’re wanting to connect with your experience and your expertise. You have to be able to put yourself out there in order to connect with people in that way. We have been blessed and blown away by the things that have happened with because of the 5dollardinners.com website. We’ve have had millions and millions and millions and millions of visitors onto our website over the years, many millions. I don’t think we’re into the hundred millions yet but we might be close. Many, many millions over the years. I’ve had the opportunity to appear on national television. Numerous times on national radio. Numerous times I’ve had the pleasure of getting to meet many of our readers in person. I’ve had some face-to-face time with them which going from, all across the board, I’ve had this incredible opportunities. I’ve been able to form great relationships with a number of different large food brands, and corporate headquarters, and their peer teams here in the US. I’ve learned a ton about myself, about our family, and about how we operate with our family life and our business in our life, how that weaves all together. I think, looking back, one of the most important lessons I didn’t realize until well into the journey was that being an entrepreneur, owning my own small business, in working on this online business space, it’s really all about personal development. Business development, yes, that happens. But it’s the personal development that happens that drives the business development, and I think that’s a real crucial part of this blogger journey, of this entrepreneurship journey, this online business journey, is that personal development that comes along with it. My number one tip for new bloggers would be consistency, consistency, consistency. I mentioned that a minute ago with having the plan for your content. But if you’re not consistent with your content, people aren’t gonna come back to connect with you. They’re not gonna come back to hear the next part of your story. They’re not gonna come back to see what other recipe you might be sharing. Whatever the story in the content is that you have to share, whatever the lessons you have to share with people, they’re not gonna come back if they’re not consistent. They’re not gonna enjoy your email and newsletter if you only email – they’re not gonna stick around on your email and the newsletter if you only email once every 10 – 12 weeks. You’ve got to be consistent with your content and the marketing of your content. I think that’s the number one thing that I would share with anybody starting on their blogger journey because I think that in the long run, that’ll have the biggest impact not only on yourself, but on the people that you are reaching through your words and through your content online. In summary, I would say, put yourself out there. Be consistent with your content. Work hard to get your content in front of as many people as you can who need to see your content, who want to see your content, who’re excited about the new content that you have, that you’ll bring out again in the future. Just keep at it, keep at it, keep at it, work at it, work at it, work at it. Set up routines, set up systems, set up processes to help make it easier for you. As it grows from a hobby to a business, a large business, a business with a team, just be consistent with all the things that you’re working on, all of the great content that you’re producing for those who are there to absorb, and consume it, and allow you to make that difference in their lives. Darren: That was Erin Chase from 5 Dollar Dinners. Thanks so much, Erin, for sharing your story and those tips. I love that she started out just wanting to share what she was learning. It’s similar to Sumit’s story in yesterday’s episode. Erin had a knowledge, she had this new exciting thing in her life, she was learning how to cook dinner and provide dinner for her family in a more affordable way, and that was something that she just wanted to share. So many people tell me that they don’t have any expertise or that they don’t know what to write about. They’ve got nothing that’s worth sharing but this is just a brilliant example, I think, that there are things in our lives that happen all the time that we get excited about. Maybe one of those things, those things that’s giving you a bit of energy, one of those things that you can’t help but talk to your friends about, that maybe some of them are going, “Ahh, I don’t really wanna hear about that.” Maybe that type of thing is actually something that other people do wanna hear about. If there’s something exciting in your life at the moment, maybe that could be that little thing that could be the beginning of something new, a new blog in some way. Who would have ever thought that simply saying, “This is what we’re having for dinner. This is how much it costs,” would have turned into what it has today. I’ve heard that story so many times over people starting blogs just because they wanted to share something that they were learning. That’s why I started ProBlogger. That’s why I started Digital Photography School. There were places for me just to record what I was learning in the hope that other people will join in in those ways. Love the tip there of starting with a consistent plan, the same plan each week. I don’t know if you picked up, she said every week day, she shared the dinner she was having and how much they cost, the weekend was the round up post. This is a really simple format. Your format might be the same type of thing. You might do weekdays one type of post, on weekends another type of post, or you might mix it up even more. Back in episode 12, I suggested a different kind of format. Mondays, Tuesdays, Wednesdays Thursdays, Fridays, Saturdays might all be different types of posts. You might write a review one day, an opinion piece another day, a linked post another day. Back in episode 12, I give you kind of a sample format for what you might do in a week. If you’re struggling to find your groove with an editorial calendar as you’re starting out, you might wanna listen to episode 12. I also really resonated with that mistake that Erin talked about, not putting yourself into the blog early. Again, I’ve said this a number of times, in Vanessa, my wife’s blog, she really resisted putting her face on it, putting her name on it, it’s almost like an anonymous blog in the early days, but it really came alive when she posted a selfie one day and injected herself into it. People do want to have that personal connection with you. It does help to grow your blog. There is probably a time and a place for anonymous blogging as well. We’ve had a podcast on that which I’ll link in the show notes but certainly if you can inject your personality, yourself into it, really can bring things alive. If you go and have a look at Erin’s site, now you will see she’s everywhere. There’s videos of her all over the place and all over the content she delivers today. She’s sharing the recipe but it’s on video and injecting her personality into it. That lesson she shared about being an entrepreneur is really about personal development. If you wanna grow your development as a business, you need to develop yourself. It’s such a great lesson there, reminded me a little bit of my own journey in terms of realizing that my physical health is connected to the health of my business. I’ve talked about that back in episode 38. But certainly, developing your skills in leadership, in communication, all of these sort of personal development type skills do fall on and impact the growth of your business as well. There’s so much good stuff in there and of course, that theme that you will be hearing from a lot of the bloggers that we’re featuring this week, consistency is just so important. Consistency, those little things that we do everyday that add up to the big things. If you’re starting a blog, and if you’re thinking about starting a blog, I hope that there’s been some goodness in there. If you are already a blogger, I am sure you’ve got some good stuff out of that as well. I really look forward to connecting with you tomorrow because tomorrow, I’ve got another blogger for you. Tomorrow’s blogger is a finance blogger. We’ve gone through DIY, we’ve talked tech blogs, we’ve talked recipe blogs, and tomorrow, we’re getting into finance blogs. There’s something for everyone in this series. I do hope that you are enjoying. Remember, if you are thinking about starting a blog, head over to problogger.com/startablog. If you want to grab the transcript from today and any of the links that we mentioned, you can head over to the show notes from today at problogger.com/podcast/223. Thanks for listening, chat with you tomorrow! The post 223: From 0 to Six-Figure Blogger in Two Years – A Recipe Blogger Tells Her Story appeared first on ProBlogger.